Medical Image Backup Must Be A Top Priority! No matter how well your PACS system is designed, eventually a hardware or software problem will strike. When DICOM images are lost, patient care declines and legal liability follows. The "best" method of data protection is automatic, off-site backup. 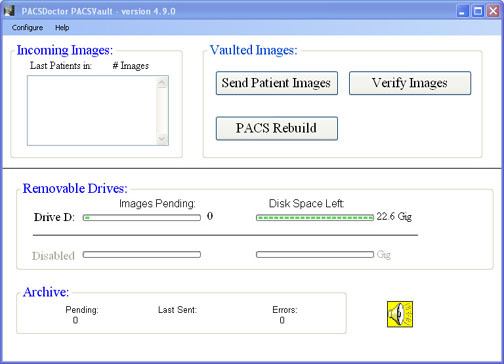 PACSVault provides easy, automatic, non-intrusive backup of DICOM images. PACSVault automatically copies your images, but won't increase complexity. Images flow to the PACSVault for backup. Try it now for free. The user interface is intuitive and simple.